At Dau Family Eye Care we believe in the importance of delivering the highest quality eye care in a relaxed and light-hearted family environment. We strive to make sure our patients know they are respected and appreciated by delivering a highly detailed examination and providing products that we are proud to offer. Our team is a family that works its hardest to ensure that every patient feels a part of the family, and are being helped by people who truly care about improving their quality of life. 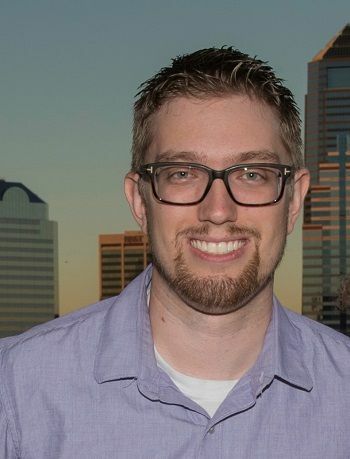 Dr. Jordan Dau was born and raised in Lincoln, Nebraska. He graduated from the University of Nebraska – Lincoln in 2011 with a B.S. in Biosystems Engineering but realized during his schooling that his true calling was to save vision. He attended Southern College of Optometry in Memphis, Tennessee the following year, and graduated in May 2015. While in school he met his future wife whom he followed to Jacksonville, Florida and has been practicing here since in a variety of settings. After working multiple locations throughout Jacksonville and the surrounding area, Dr. Dau felt that there was room to create something special where he could offer superior service and superior products in a family setting. Throughout his work and school, Dr. Dau has been involved in multiple medical mission trips to areas of less fortunate countries to provide free eye exams and glasses for local populations. He is currently a member of the Northeast Florida Optometric Association and the American Optometric Association. He loves working with the pediatric population with other areas of interest including ocular disease and contact lenses. He remains a true Husker fan but is learning to tolerate the SEC and the Jaguars, and also enjoys reading a good book or playing a good game, all while spending time with his loving wife. Dr. Madeline Dau is a Jacksonville native, growing up here and attending Bishop Kenny High School before studying Nutrition at the University of Florida. Madeline has always cared about helping to improve people's lives, and felt she could make a significant impact by learning to care for vision and health. She was excited to return to the area after graduating with her Doctor of Optometry degree from Southern College of Optometry (SCO) in Memphis, TN in May of 2015. While at school, she went on medical mission trips to provide free eye exams in underserved areas in Jamaica, Belarus, Belize, and Colombia with other SCO students, including her future husband Jordan Dau. 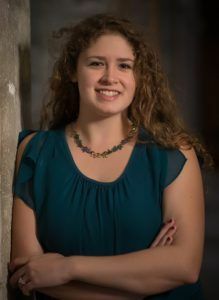 Since graduating she has been a member of the Northeast Florida Optometric Society, Florida Optometric Society, and American Optometric Society. While working in Jacksonville the last couple years, Madeline has worked with several different practices but now is excited to start something new and shares her husband's vision for a high quality practice that truly cares for their patients like a family. Ever passionate about eyecare, she looks forward to taking care of the Bartram Springs area and beyond. Her areas of interest include dry eye treatment and contact lens fittings, including myopia prevention. In her spare time, she enjoys walking Wrex and Sevro, her adorable corgis, and cooking overly complicated recipes she finds on Pinterest for her husband, other Dr. Dau. Janet was born and raised in Palatka, Florida and lived there until meeting her future husband Sean Thibodaux, where they moved to Gainesville. While there she started her first optical job and fell in love with the profession. Janet completed an opticianry apprenticeship from 1998-2002, became ABO and NCLE certified, officially became a Licensed Optician in the state of Florida in 2002. 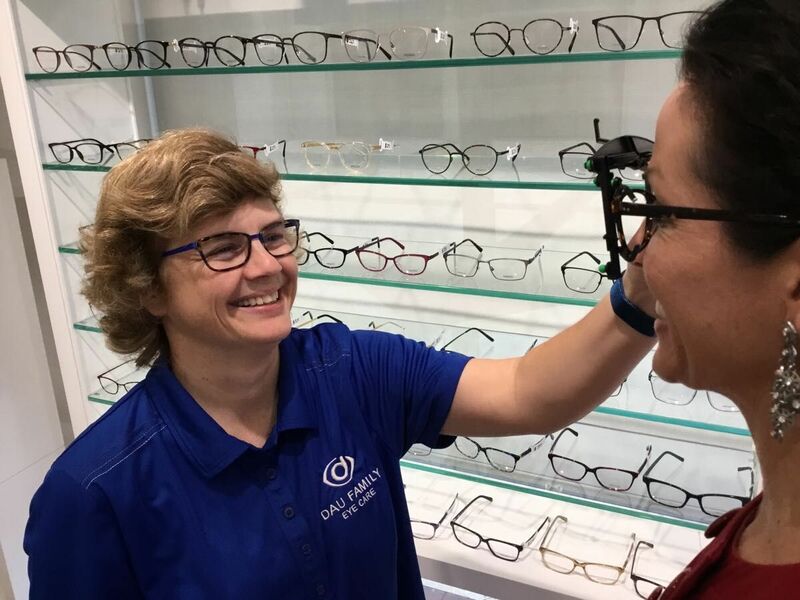 Janet moved to Jacksonville shortly afterwards, and worked as an optician specializing in manufacturing glasses for over 10 years, then transitioned into a variety of positions including a sales associate, retail manager, and store manager. After stepping into roles that put her further away from the work she started doing, she wanted to start over with something new. Wanting to exercise her knowledge and experience on a more personal level, and being a resident of Bartram Springs herself, Janet was excited to learn about Dr. Dau's vision for his practice, and has been a part of the foundation of Dau Family Eye Care since the first day. In her free time, Janet loves spending time with her husband, cheering for the Jaguars, and being with her two Frenchie fur baby pups, Boudreaux and Marie Laveaux.